Description: From Stamps Happen this nice stamp is called: The Forget Me Not Frame. Gorgeous stamp with flowers in every corner and a ribbon outline for the center oval. GORGEOUS!! Description: From All Night Media and Posh Impressions comes this wonderful Big Jar stamp. Put any candy or treat inside and create a great shaker card. IMAGE is 3 1/2" x 4" - Wood is a lot bigger than the image. 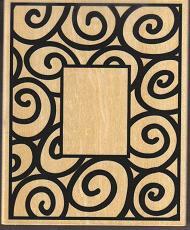 Description: This stamp is from All Night Media and is a very nice frame stamp large enough for greeting cards or scrapbooking. Stamp the image, cut out the inner frame and insert a photo for those personalized projects. Size: Outer frame is 3 3/4" X 4 3/4", inner frame is 1 3/8" X 1 7/8"